Our 20′ storage containers are solid, heavy duty conex boxes made of steel. They come with industry standard weather-tight doors and all come in the conventional outside measurements for 20′ cargo containers of 20′ x 8′ x 8′.6″. They’re a favorite pick among building contractors and builders for temporary storage of tools, equipment and materials at building sites. The 20′ shipping containers are highly mobile and offer exceptional ease-of-accessibility. The bottom of each of our 20′ containers is lined with a 1 inch thick wood floor to make moving items in and out of the container easier, adding an extra layer of protection for your property and improving the overall durability. The wood flooring in our 20′ storage containers is tough enough and smooth enough that pallet jacks and forklifts can be utilized to transport heavy laden pallets in and out of the storage container. The 20′ storage containers are exceptionally suited for the storage and transport of just about anything. Due to the exceptionally mobile nature of our 20′ storage containers they’re ideal for temporary use at building sites. Contractors use 20′ storage containers on job sites for the temporary storage of their tools, equipment and materials. With all-steel storage containers, there’s the added security for temporary storage of valuable building materials, construction tools and equipment. 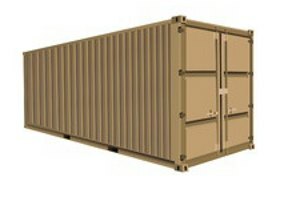 The heavy duty construction of our 20′ shipping containers provides peace of mind. If these things can survive going across the ocean tied to a ship and exposed to the elements, sitting on a construction site or residential lot should not be an issue! Your property will be secure and protected. Contractors repeatedly turn to 20′ storage containers on their job site for temporary storage of tools, equipment and building materials. 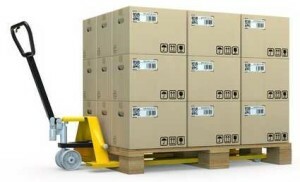 Container weight - gross 67,200 lbs.